A year ago this week, we moved into our home in the City, after a whole year of construction. It was well worth the wait, but in hindsight, we probably could have waited a few weeks longer. But, I just needed to be here! Truth be told, I needed to be here so that I could finish off the design while living in the house. I made a few mistakes ordering furniture pre-move in, but luckily I was able to correct them. 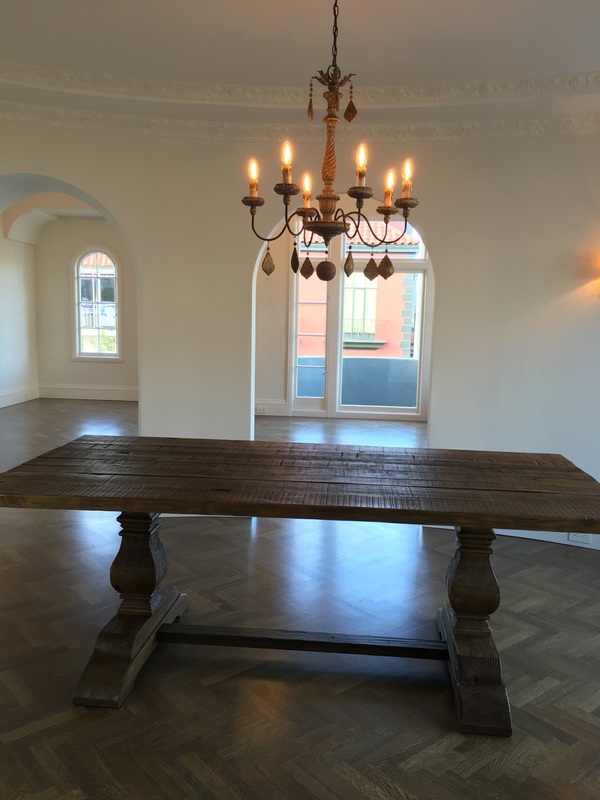 The dining table was the perfect choice for this room though and was delivered a few days before moving day. It was so much fun hanging our clothes in the master closet after a year in the rental with no closet space! Here it is on moving day. In March, we finally got our window coverings, so we no longer were living in a fish bowl! They made such a difference. The house finally felt like it was coming together. Slowly, the rest of the furniture arrived. The sofa from Restoration Hardware came in June. The coffee table and chairs from Williams-Sonoma Home soon after. The family room sat empty for a while. Eventually, it came to me to furnish it with a leather sectional and hang my collection of pastoral oil paintings above. With most of the inside coming together, I decided on a whim one day to hang the vintage floral oil paintings in the garage that once lived on our stair wall in the old house. Which brought me to the idea to just use the same paint that I used on the outside of the house, inside. Now the paintings really stand out. It give me such pleasure to see them, even in the garage! Probably the biggest project though was finishing off the roof deck with plants for privacy. Martin hoisted every shrub up to the deck with a rope and pulley. Planting day ended up being one of the rainiest days of the year! A few weeks later, he hoisted the furniture up. I still had a few projects left in me though. I eventually bit the bullet and ordered wallpaper for the dining room. It was a little scary to paper this room because it's oval and there are arches without moulding. The installer was flawless though, and I'm so glad I did it! I also wrapped the guest room in the same paper, in the charcoal stripe. Finally, the house was done. I don't think a house is ever really "done." 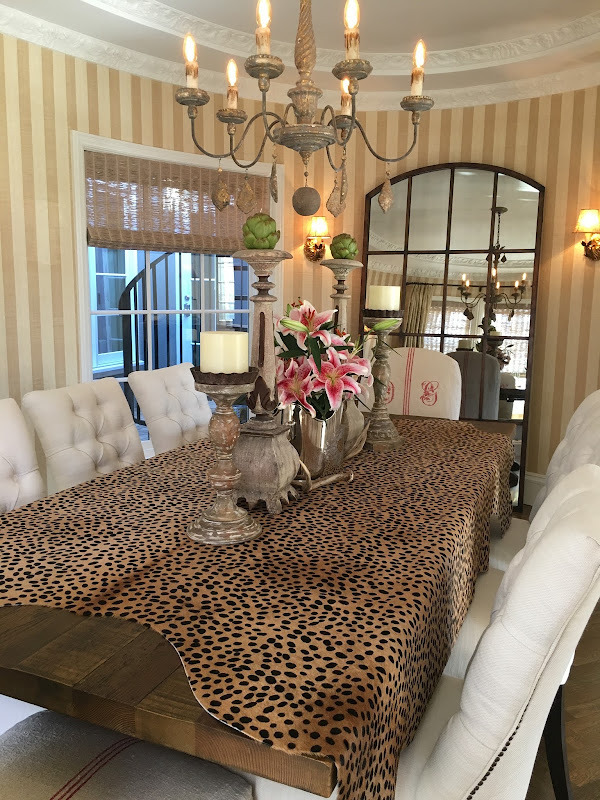 It evolves over time as centerpieces come and go, decorative objects are moved around, shelves are restyled, linens are refreshed, and pillows updated. That's the fun part--being creative in your living space. When we sold our old house, I felt like I lost my design muse, but after a year in our new house, I feel like I found my muse again. Thanks for sharing your new home. I was beginning to wonder if we were ever going to blog about it. Maybe next time we can get a look at the kitchen? Everything looks lovely so far! Happy for you to have managed all this within a year! Yes, we constantly do shape and fine tune our "NEST" and that is a good thing! We had a very sad tiding that our dear friends in Sarasota, who sold their mansion and moved to a smaller villa in North Venice, had also just completed their last project; the outdoor kitchen near the pool area. Now her husband died of a fatal heart attack. He used his dream kitchen once... So very sad. That teaches us to ENJOY every single day of our life. Happy and Healthy 2017 to you both! I agree, you still have it. The rooftop garden is over the top fabulous. No doubt you will enjoy your beautiful . And it was fun seeing you work your magic. Delores, you haven't lost your design muse. Everything looks gorgeous. 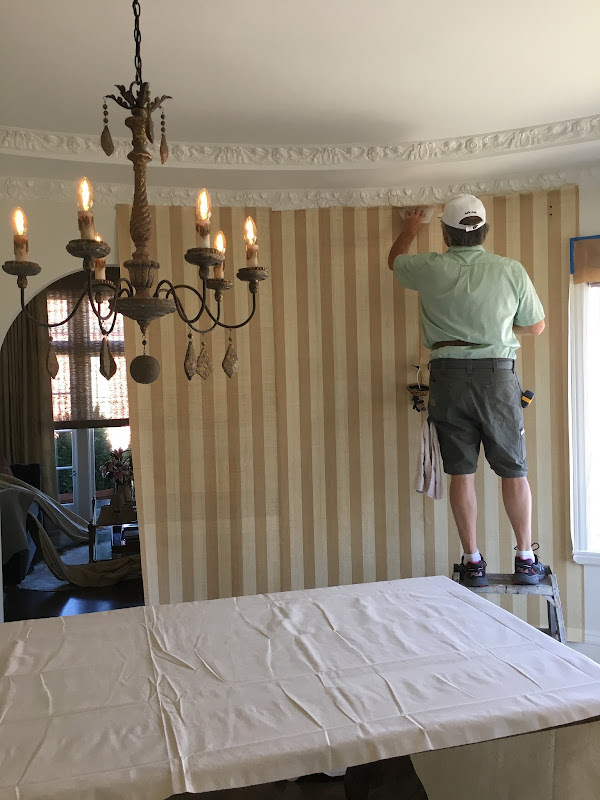 In love with the oval dining room and the stripe wall paper with the molding. Any place you live will quickly become a home with your talented eye for detail. I think moving is like starting a new book. It sometimes takes awhile to get into it, but soon one is totally hooked. Enjoy this wonderful new home. Your home it truly gorgeous. I love your style. Perfection. You undertook a huge project with this home and it ended up quite fabulous! I loved seeing the picture of the outside- quite a beauty now! It turned out wonderful! I love all of the choices you made. We are embarking on a new adventure this month. We are building a house. I am so excited picking out all of the finishes. Furniture will wait until we move in and see what we need and what we need to get rid of. Wow ! What an absolutely beautiful home ! I love every single room and everything in them ! So fun to see such a lovely home! It looks absolutely gorgeous and I completely understand just wanting to be IN! When I moved to the West Coast I had little more than a mattress! It's so helpful just being in your home and figuring it out from there. Love the rooftop garden! Wow, I knew last year went by quickly. I can't believe you have been in for a year. Your new home is absolutely beautiful!You have the most wonderful gift of design and attention to detail.Please show us your new kitchen.I am dying to see it.We are moving out of our house in April for a extensive renovation.I am not looking forward to apt.life with two dogs.Your blog is my absolute favorite love your style! Delores, I've so enjoyed reading your posts about your new home design and decorating processes. The results are beautiful, and have served to inspire me and look at my own home with fresh eyes. You're dining room table ended up being a wonderful choice, and I love the texture, color and style of the window treatments. May you enjoy many years of happiness in your new home, and, please, continue to allow us in for a peek whenever you make changes. In a way, I feel like I have a vested interest in your home. At last! Love every inch of it. Thanks for finally sharing. How do you like the location?